Janet Ross (born Janet Ann Duff Gordon, 1842-1927) was an English writer. After her marriage to Henry James Ross, she lived in Egypt for six years, during which time she was a correspondent to the London Times. From 1867 until her death she was a resident of Florence. She wrote for English magazines and collected her works into various books such as Leaves from our Tuscan Kitchen, Old Florence and Modern Tuscany, Italian Sketches, Lives of the Early Medici as Told in their Correspondence, Florentine Villas, Three Generations of English Women and an autobiographical memoir entitled The Fourth Generation. Her writing contains a number of anecdotes about her acquaintances such as Carlye, Tennyson, Dickens and Mark Twain. She was on congenial terms with the American writer when he and his family lived in a nearby villa in Florence. She wrote of them: "The Clemens family were very pleasant neighbours. He used to drop by at all hours...I confess I preferred Mr. Clemens, keen-sighted, sensible and large-hearted, to the amusing, laughter-provoking Mark Twain." There is a biography of Ross by Sarah Benjamin: A Castle in Tuscany: The Remarkable Life of Janet Ross. Sydney: Murdoch Books (2006). What follows, below, is an excerpt from Chapter 4 of Ross' The Land of Manfred, Prince of Tarentum and King of Sicily. Rambles in Remote Parts of Southern Italy with Special Reference to their Historical Associations. Illustrated by Carlo Orsi. With a map. (London, John Murray, Albermarle St. 1889). The excerpt has to do with the Castel del Monte, built by Holy Roman Emperor, Frederick II and is best read in conjunction with those two linked items. The image here below was not part of the original book. There is an additional short excerpt from The Land of Manfred in the entry on King Manfred of Sicily. ...Leaving the carriage at the solitary farmhouse, we climbed in the hot sun up the steep bare hill, and now saw that what had seemed a round tower in the distance was an octagon, with low octangular towers at each corner, slightly higher than the castle walls. Built of limestone of a rich creamy yellow colour, which was quarried from the hill on which it stands, Castel del Monte is in a good state of preservation. The Italian Government bought it a few years ago from the Caraffa family, who, fallen from their high estate, had allowed shepherds to stall their flocks in the rooms which had once re-echoed to the songs of the minstrels the great Emperor delighted in, and bandits to hide in the recesses of the towers, while its walls were stripped of their marbles to ornament churches at Andria. Glass has been put in all the windows, and the two doors, of which an old guard, who lives in a hut close by, has the key, have been repaired. He was delighted to see us, and said his life was very lonely, and that if it were not for Vigilante (his dog) he should not be able to bear it. Castel del Monte, as I have already said, is octangular, built round a courtyard, with eight octagon towers, one at each angle. Between each alternate pair of towers is a Gothic window, divided by an elegant column of pink marble with a rosace at the top. The window above the chief entrance is wider than any of the others, and is ornamented with columns and tracery. There are eight large rooms on the ground floor and eight above, while five towers contain small, six-sided vaulted rooms, and the other three winding staircases. The principal gateway, all of rosy marble, faces the sea to the east, and is situated between two towers; a pair of guardian lions uphold the columns, and the whole is light and harmonious, severe, yet elegant; a happy mixture of Gothic and classic, Renaissance and antique. Several steps lead up to the entrance, and a doorway on the right hand, of fine proportions, opens into the other seven great halls. The castle being a perfect octagon and built round a court, every room is much wider on the outside. Half columns of red breccia marble with Corinthian capitals stand in the corners of the rooms, from which spring marble ribs supporting the vaulted ceilings, united in the centre by a large rosace of flowers and heads. The remains of a marble bench which ran all round the walls are still extant in some places, and broad marble steps lead up to the windows. There are a few traces left of the white and rosy marble which clothed the walls, and one hall still has a remnant of its mosaic floor. Three of these halls have doors leading into the courtyard, where there is a large cistern of excellent water; one doorway is quite plain, the others of ogival shape and diversely ornamented. The upper floor which was inhabited by the great Emperor, is more richly decorated. In lieu of the one half column of breccia, the vaulted roofs, which were in mosaic, are supported by a group of three columns of white marble in each corner. From four rooms the view is superb, three others have windows looking into the courtyard, and in two of these are immense marble chimney-pieces, which the old guard called "cimminere." The room over the principal entrance has but one door, so that one cannot make the circuit of the rooms. This was probably the favourite room of Frederick II., and as we mounted the six pink marble steps and sat down in the embrasure of the large window, I tried to recall the past glories of his time. The Emperor loved magnificence. Oriental ambassadors brought him costly hangings, silks, and carpets, while his own manufactories in Palermo rivalled the East in the beauty of their productions. Frederick II., like his son Manfred, was accused of favouring his Mohammedan subjects of Sicily, and of adopting their manners, and even their creed. He spoke their language, admired and cultivated their science, and caused their philosophy to be translated into Latin. The sunny land, with its bright towns reflected in the blue Mediterranean, and the gaietv, the polished manners, the beauty and the poetrv of his southern subjects, were far more congenial to the great Emperor than the cold climate and coarse habits of the Germans. Had the Hohenstaufens not been dispossessed by the dvnasty of Charles of Anjou, and the whole land thrown back many centuries, the social and intellectual advancement of the world would have made rapid progress. Castel del Monte was built about 1238, and all that we know of the architect is the legend that Frederick II sent one of his courtiers to see how the work was progressing. The messenger met with a lovely damsel at Melfi, and stayed with her until summoned back by the Emperor. Thinking that his master would never face such bad roads or have time to visit the castle, he trumped up a story of total failure. Enraged at the account, Frederick sent guards to bring the architect to his presence, who destroyed himself and his whole family on receiving the message. The Emperor went to Castel del Monte, and finding out the falsehood, he dragged the offender by the hair of his head to the top of one of the towers, and hurled him down from the battlements, as a peace-offering to the "manes" of his best architect. There are no inscriptions of the Hohenstaufen to be seen; but what recalled Frederick II vividly to my mind were the hawks, sailing about and shrieking sharply as they flew in and out of their nests in the walls of the castle. We went up on to the roof, which is flat, and paved with immense slabs of stone, whence the rain runs into the cisterns on the top of every tower. The view is glorious; at our feet an immense rolling green plain, with here and there a white farmhouse and large herds of cattle, sheep, and horses grazing. Now and again the soft melancholy tones of the shepherd's pipe or the long drawn-out notes of an eastern-sounding song, broke the perfect stillness. The whole sea-coast, from the promontory of Mount Garganus and the Bay of Manfredonia to Bari, and right away to Monopoli, dim in a purple golden haze, lay to the east and north. Barletta, Andria, Trani, Bisceglie, Corato, and Ruvo shone white in the sunlight; fishing-boats dotted the brilliant blue sea, and we understood why the peasants call Castel del Monte "La Spia delle Puglie" (the spy of Apulia). On the west rose the dark, purple, rugged hills of the Basilicata and the fine cone of the extinct volcano Mount Vulture, and southwards the long chain of the wild hills of Le Murgie faded away out of sight. Vineyards made brown patches in the landscape, and the "Caselle" looked exactly like thousands of Arab tents scattered over the country, which was intersected with the long yellow lines of straight roads leading from town to town. An ideal country for hawking, which was the favourite sport of Frederick; but we wondered where he kept his horses, hunting equipage, and retinue, for the castle could not have contained them, and there is no room on the conical hill for anything else. At the bottom of the hill we afterwards found traces of buildings, which we were told had been destroyed in order to take the stones to Andria. Poi si educan le donne collo fiato dell 'uomo. Nu brindisi i faccio a tutti i Signori. Ed io mi bevo i vini." After this grand speech we finished our repast, and I went to find out what unknown flower I had seen from the castle windows, shining like a crown of gold in the sun, on a dark green stem; while my companions went to sketch. My flower, as I afterwards found out, was an asphodel, and I only saw it near Castel del Monte, where the people call it "Arrusha," which is the Arab word for bride. The old guardian said he had heard something about it in relation with King Manfred; but as he had a sublime contempt for all "dicerie stupide del popolo" (stupid sayings of the people), he could not tell me what. He was almost angry when I inquired whether the great Emperor or his handsome son Manfred were never seen at night in the castle, or riding in gallant array with their hawks on their wrists on All Souls Eve. Such things were only fit for poor peasants, not for educated people who could read, and I had better come and amuse myself with the visitors' book, and write down my name. 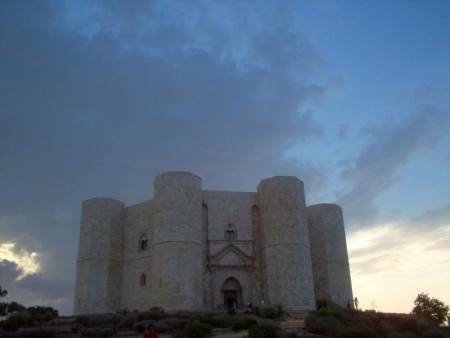 Castel del Monte was destined to be the prison of the unfortunate sons of Manfred and Helen. When mere babies (the eldest, Henry, was only four years old) they were torn from their mother, and could only count the long dreary years by the increasing weight of their chains. They were clothed and fed like beggars, deserted and forgotten by all. After thirty-two years Charles II seems suddenly to have remembered his father's unhappy captives, and a writing of his is still extant ordering that they should not be allowed to die of hunger. The following year, in June, 1299, they were transferred to the Castel dell' Ovo at Naples, where their sister Beatrice had been imprisoned for so long. The end of these unfortunate princes is shrouded in mystery; according to one account Frederick and Azzolino died before their eldest brother, and are buried at Canosa, where two plain slabs of stone, not far from the tomb of Bohemund, are shown as their graves. Another legend says that Frederick escaped from prison, and went to Egypt. Henry, the eldest, was apparently still alive, and a prisoner in the Castel dell' Ovo in 1309, where he is said to have died, blind and old, in the reign of King Robert. Their mother was imprisoned in the castle of Nocera, a town between Salerno and Castellamare. Charles of Anjou only allowed forty ounces of gold yearly for her maintenance, after despoiling her of Corfu and her own rightful possessions in Greece. Helen died in February, 1271, aged twenty-nine, and no trace of her grave is to be found at Nocera, while the castle, where the beautiful Queen lay a prisoner, is a heap of ruins. The inventory given to the King at Naples by Enrico della Porta, her gaoler, of the very small amount of clothes, jewels, and furniture she left, brings her misery vividly before us. Everything is marked as "consumptum et vetustum," worn and old.